Today I'm hoping to get rid of the bad taste that was last week's Be a Player blaster! That box was very disappointing, but hopefully a blaster of Panini Certified will make up for it. Certified blasters are a bit pricier than what I usually like to buy at retail, but the price is consistent with what you would pay per pack at a hobby store. That being said, I was able to get this box for half the retail price at dacardworld.com. 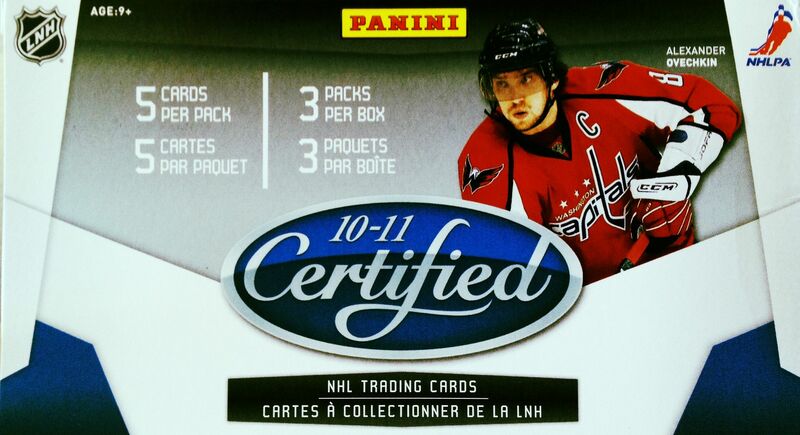 I love the fact that Panini puts out Certified at retail stores. It's a great option for collectors who want to get their hands on a hobby product when a hobby store isn't around. Like I said, these blasters do cost more, about $30/box, but when you compare that to a standard hobby pack of Certified... it comes out pretty much even as hobby packs are about $10 each. Each blaster of Certified will come with one hit. This is also pretty comparable to its hobby brethren. In a 10 pack hobby box of Certified, collectors could expect to find four hits (unless it was a hot box - in that case it would be more). So it works out to a hit per 2.5 packs. Well, with 3 packs in a blaster, it's pretty even. And for the record, I have gotten 4 packs of Certified at the hobby store and gotten no hit. So at least here with the blaster it's a guarantee. I was able to pick up this box of Certified for under $15. That's a really great price for one of these. At this price, if you bought four blasters to get four hits you would be only paying $60. That's less than a hobby box! I feel like I've been talking a lot of math. Time to stop! It was pretty obvious to me which pack had the hit in it as it was noticeably thicker than the others. On the off chance it was a decoy, I went and opened it first. Yep, a hit was there so I decided to save it. I think many collectors do this to hopefully have a big ending to their break! As for the packs without the hit, I thought they were decent. First off, the cards look really great. I am always impressed with I see 10/11 Certified base cards. There is something about them that just scream 'premium card' to me. Scans and pictures do not do them justice. The 10/11 base have not yet been topped by the subsequent iterations of Certified. And as for the cards themselves, it was very nice to pull a few Sharks out of these packs. Though not in my top three, I really liked the Dany Heatley base that came out. It was a toss up between Heater and Marleau - and I really wanted to put Heatley in, but Patty Marleau had such a blazing hot start to the season that I had to go with him. 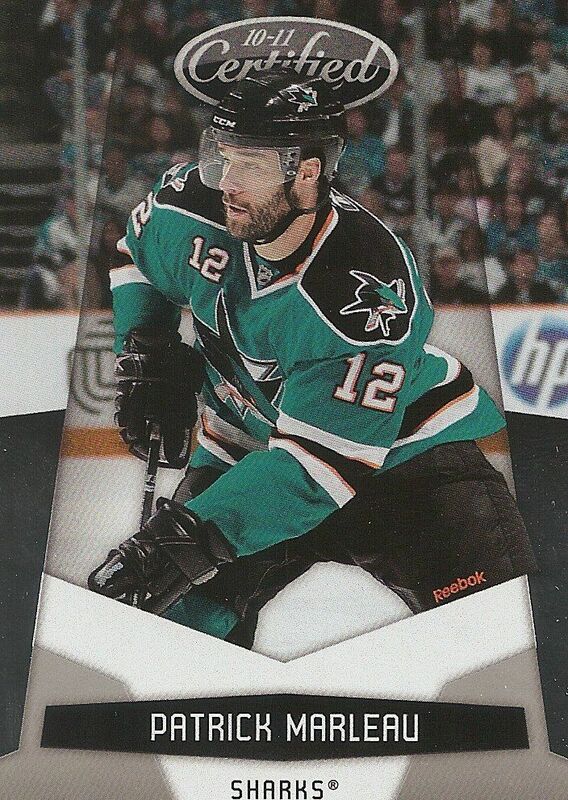 It's awesome how Marleau is pictured in full beard here. You never really see him sport the beard unless its playoff time. It's a cool and different shot of good 'ol number 12! 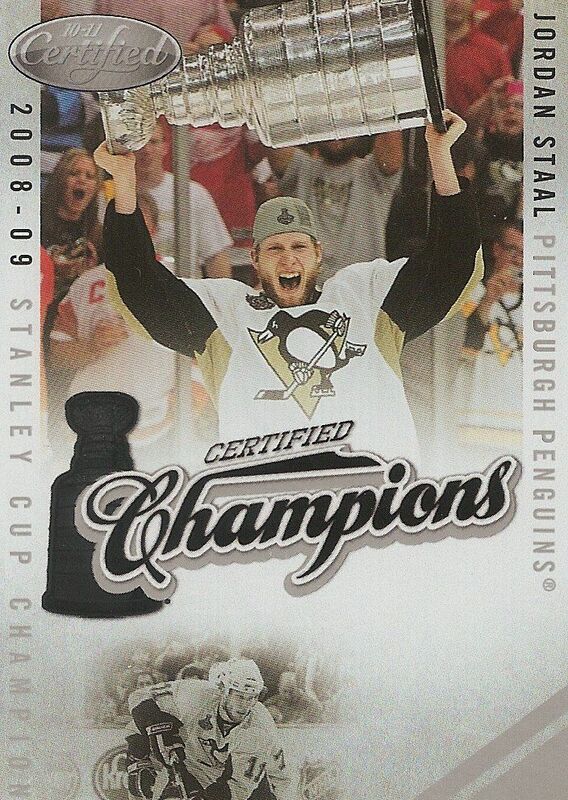 My only insert card of the break was this Jordan Staal Certified Champions card. Though I'm not a huge fan of the design of the card, I always appreciate being able to pull serial numbered cards out of blasters. This particular card was numbered 463/500. I think the idea with this card was to feature an autograph at the bottom. If an auto were there this card would look so much better. As it is though, the bottom portion looks like a bunch of wasted space. Panini has improved in this design area recently, and I'm thankful for that. I was happy to get this card - great player and relatively low numbered (for a retail product). Though Datsyuk plays for the rival Red Wings, he has always been a gentlemen and a pleasure to watch skate. He has crazy moves and amazing stick handling. 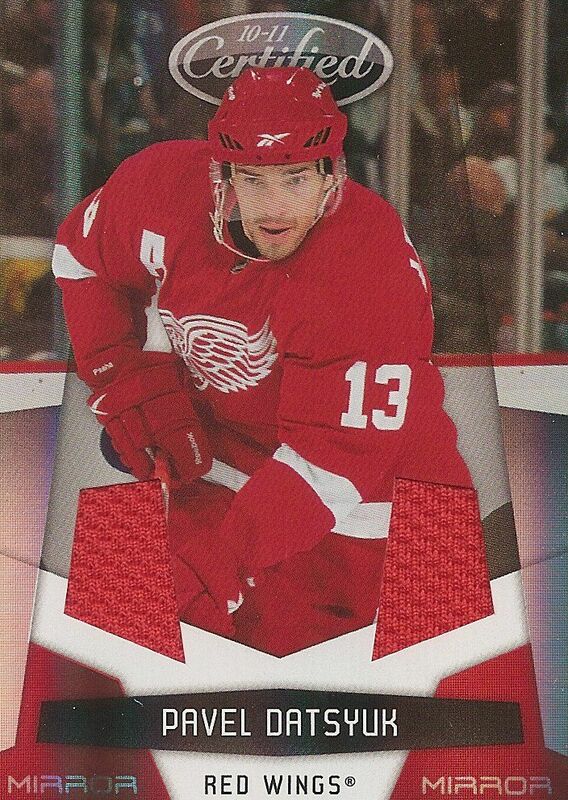 This Mirror Red jersey card works well because the whole thing is pretty much team-themed. There's just a whole lotta red on this card. This particular card is numbered 46/50. At $15 I'd buy this stuff all the time! It's a very nice deal... and as I mentioned before, if you're just looking for hits, four blasters will give out the same number of hits as a hobby box of it. At the $30 retail store price, Certified is above the impulse buy price for me, but it still is a fair deal for what it is. I've seen and heard a lot of good things coming out of these Certified retail blasters. They are definitely a box that I would recommend to give a try! Let me know what you thought of my 10/11 Certified blaster down in the comments below. What have you gotten out of these blasters? I'd love to know! thanks! decent card from retail!